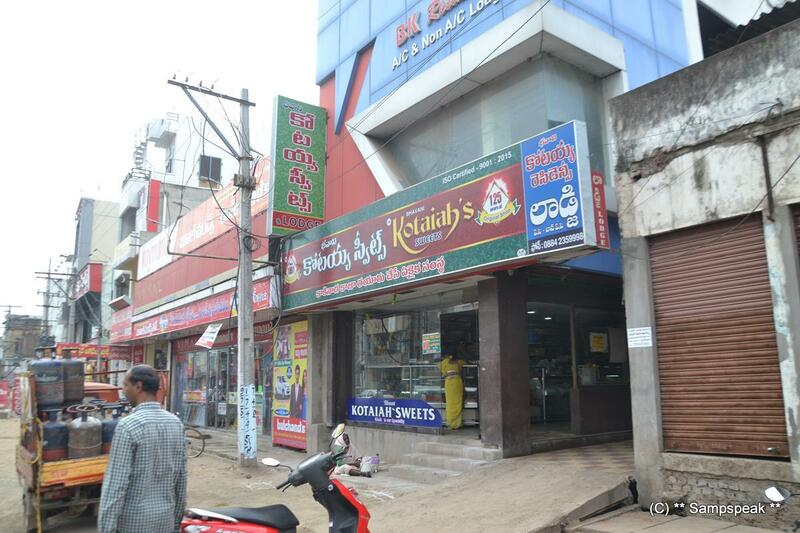 "Sampath Speaking" - the thoughts of an Insurer from Thiruvallikkeni: utterly delicious 'khajas' of Kakinada !! 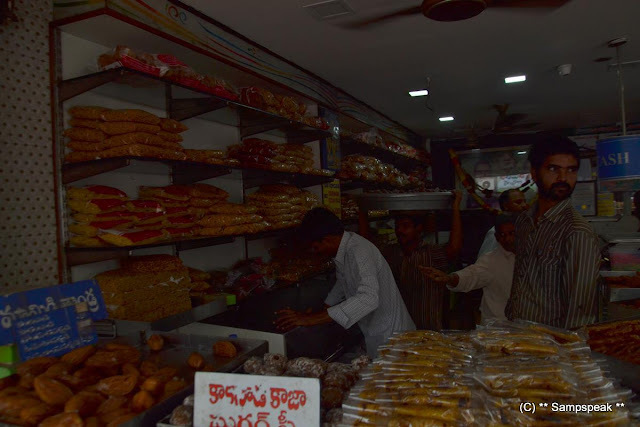 Ponugupati Kotiah along with his son Venkata Apayya, moved to Kakinada from Repalle village in Tenali, Guntur district, in 1900 and started a sweet shop named Kotiah Sweets in the main market.” An erstwhile farmer, he came to this town and literally found his pot of gold — sweet gold. I lived in Kakinada for 6 years and recently had happiness of visiting the place again. The district headquarters of East Godavari was a very calm and pleasant place as observed by in 1990s. Those days, there was the Main road, Cinema road and another parallel road – now found that the city has changed a lot. In earlier days, the village called Kakinandivada was a Dutch settlement. Some would say that it was known for coconut products and hence Cocanada. Train journey is most enjoyable as one can spend time leisurely eating the choicest delicacies and look through the window the different culture, fields, people and everything as the train chughs past different areas. Interestingly, Indian Trains have Names besides the Numbers. As you would know, Trains now have 5 digit numbers – earlier they were 4 digits. I have travelled so many times in this particular train no. 7043 [Chennai Central to Kakinada] – now it is 17643 [Chengalpattu Junction via Egmore – Vijayawada to Kakinada]. Kakinada is also known as ‘Pensioner’s paradise’ and old timers were happy in calling it ‘Second Madras’. Kakinada in fact is a planned, neat peaceful city. There are several edible oil refineries and the Port has become busy now a days. The word ‘Circar’ – noun would mean a District or part of a Province. This is a common word to old timers as there was the ‘Northern Circar’ - which was a former division of British India's Madras Presidency, which consisted of a narrow slip of territory lying along the western side of the Bay of Bengal in the present-day states of Andhra Pradesh and Orissa. Circar region mainly corresponding to Coastal Andhra and comprised some of the modern day places in the districts of Krishna, Godavari, Visakhapatnam, Srikakulam and Guntur and some in Orissa. In 1765 Robert Clive obtained from the Mughal emperor Shah Alam a grant of the five Circars. Thus over the years the possession of these places and the geographical pattern kept changing. 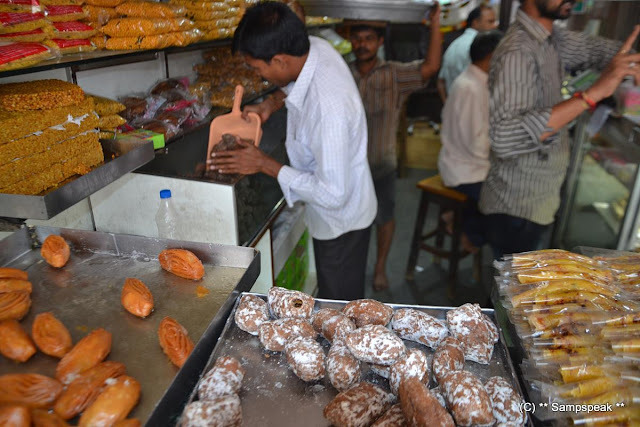 After West Bengal was awarded with the Geographical Indication (GI) tag for ‘Banglar Rasogolla’ (Bengal Rasogolla) on 14.11.2017, the Odisha government announced a few hours later that it was “in process” of obtaining the same for ‘Odishara Rasagolla.’ It originated in Odisha and is offered at Jagannath Temple as part of religious rituals by people of Odisha since the 12th century,” Odisha Chief Minister Naveen Patnaik wrote on Twitter on Tuesday night. A GI is a sign used on products that have a specific geographical origin and possess qualities or a reputation related to that origin. If rosogolla gets GI, can Khaja be far behind ?? 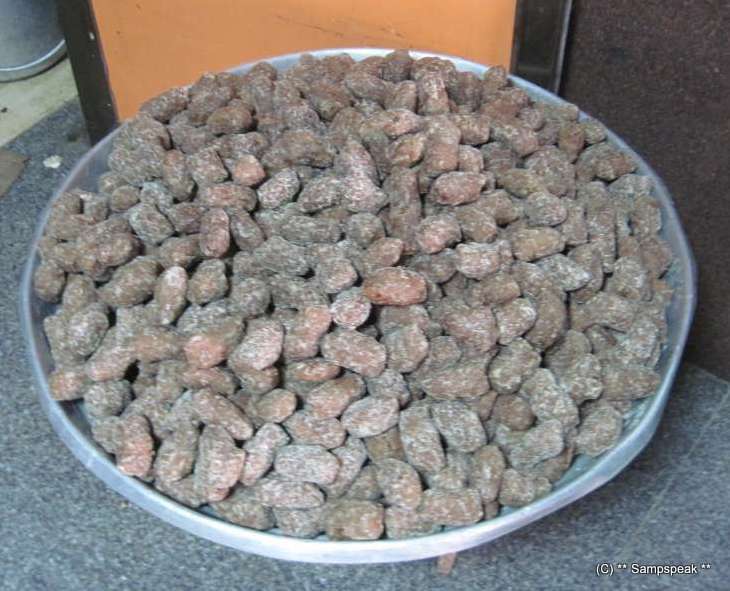 Kakinada khaja (కాకినాడ కాజా) is a sweet delicacy of Andhra, specifically Kakinada. 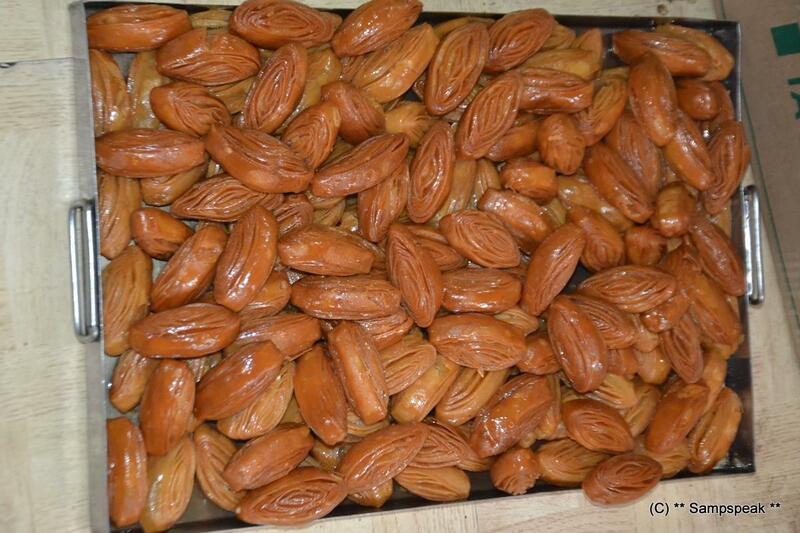 Some attribute that khaja is Arabic meaning pure or sacred. Whatever be its origin, there is no denial that it a ghee rich, succulent, melting delicacy made of fine-grounded wheat flour, sugar, ghee / edible oil. Very very tasty !! 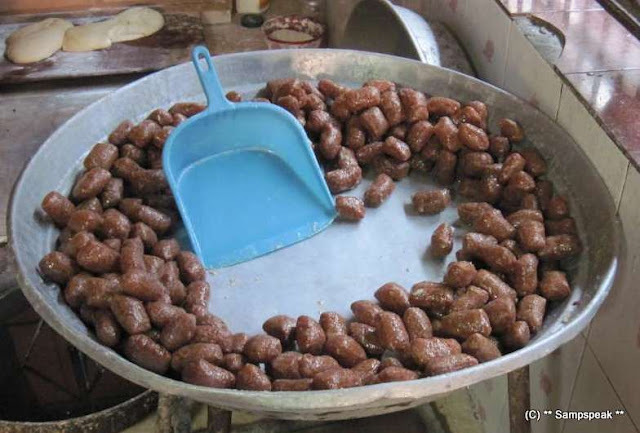 ~ the paste made of wheat flour is deep fried till crispy; soaked in sugar syrup as they absorb the watery sweet syrup. There are atleast two well know variants – the madatha khajas looking small tapes, of Tapeshwaram and the gottam khajas of Kakinada, that are dry outside, but full of syrup inside, melting and leaving one satiated for a long time. The only complaint perhaps is its shelf life ~ as maida becomes soggy and sugar syrup solidifies, the shelf-life of the gottam khaja is restricted to five days, making it difficult to be stored outside. Those days, khajas made and ready for sales in the evening would be emptied in few minutes of their arrival !! 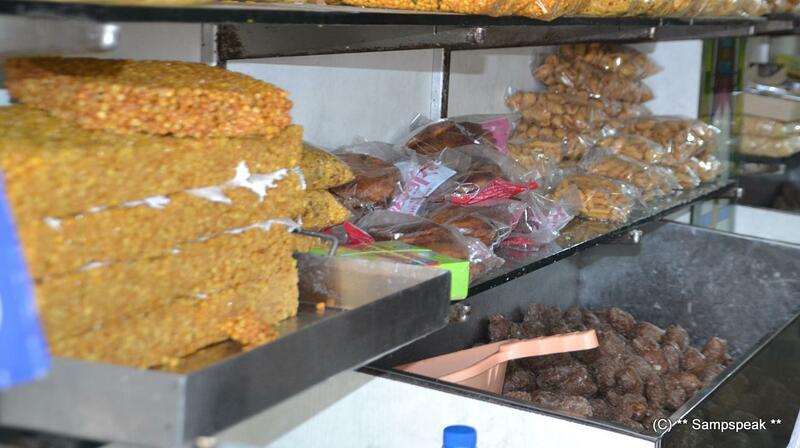 ~ here are some photos of Kotiah Khaja shop in Main road Kakinada. 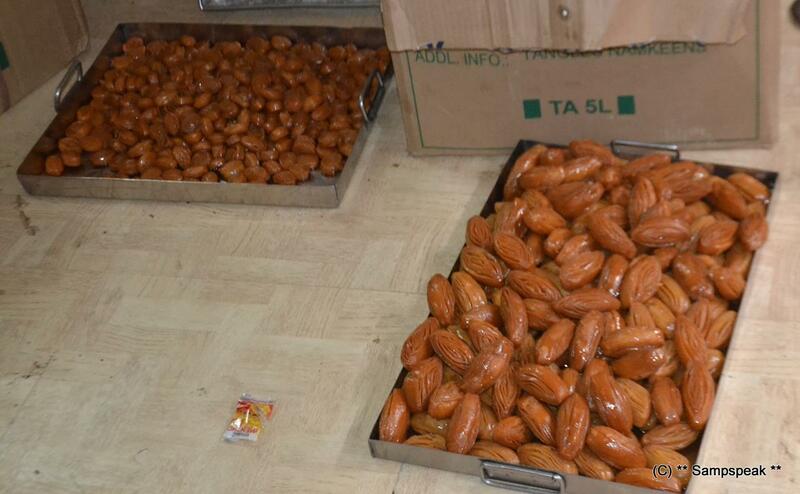 While those days, there was only one Kotiah Sweet, now they are found in few places – not sure whether it is family spread or competition.